New to us anyway. Decided to look around the Sage and Dog valley's Saturday this is where the palm and nice pet wood come from. There's a area at the north end of the valley known for Jaspers, wood and agates. We decided to look around that site if we didn't find anything cool we would go up and look for Palm the rest of the day. Hiked the hills to the south and west of the known site decided to head back to the south of the valley. For no reason at all I stopped about a mile east of the known area for one last look, less than a half mile off the road we found a nice jasper out cropping of the yellow/gold commonly found in this area. Started looking around and the hillside was covered with jasper and wood (conifer) nothing to spectacular until we really started looking close. 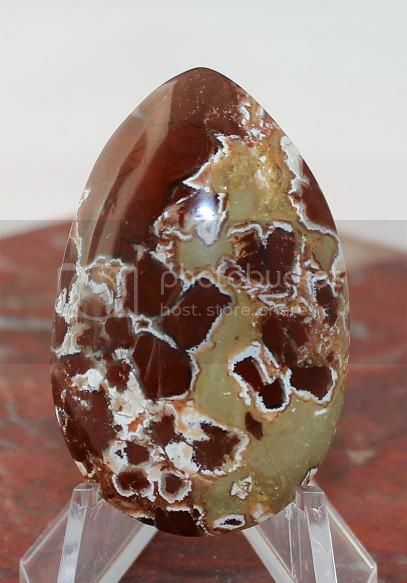 The second pics almost look like Owyhee jasper, I posted a cab I started. Don't look like anyone has been digging in this area. I can't wait to go back when I have a whole day to spend there..
Re: New Utah Rockhound Site? All three are lovely materials! Love the second one's swirls of color. Amazing what can be found between the frequented places. Mother Nature is mean, I took four people back to the new site. Found nothing to match the few stones I found the first time, some material close but no luck. But I know where to get some jasper and pet wood of different sorts anyway.